Just over a month has passed since KAPISANAN first started our relief efforts for victims of typhoon Ondoy aka Ketsana. We closed off our initial fundraising with the successful Charity is Our Second Language, formerly know as, Poetry Is Our Second Language on October 3rd, shipping 21 Balikbayan boxes to the Philippines and raising $3,093 for Global Medic’s ground efforts to bring clean drinking water to the affected areas. KAPISANAN continues to receive inquiries about what to do next, so here it is, Round 2. Home for Christmas is KAPISANAN’s second round of fundraising, supporting the rebuilding of homes, lives and families in the motherland. Starting November 1, 2009, KAPISANAN will be accepting monetary donations via PayPal or through mailed-in cheques and in-person donations at 167 Augusta Ave. until December 25, 2009. All proceeds benefit the Children’s Rehabilitation Centre, whose efforts on the ground help displaced children and their families who were all affected by Ketsana and Parma. In true KAPISANAN style, we will be having an all day Parol Making Workshop at KAPISANAN, Saturday, December 19th. For just $10, you’ll get materials for a parol, a lesson on how to make it, and the warm fuzzy feeling you get after you’ve done something good. The festivities will continue into the night, with a live auction for specially made parols. Local Filipino-Canadian artists will be donating their talent and the winning bidders get to take home original works of parol art. All proceeds from the auction and the workshop will benefit the Children's Rehabilitation Centre (CRC), to help the children and their families be Home for Christmas. Tax receipts will be issued for monetary donations of $50 or more, through the kindness of our community partner, Schools without Borders. Cheques must be made out to Schools Without Borders (or direct to SWB's PayPal account - info@swb.ca), with a memo “Home for Christmas-KAPISANAN". 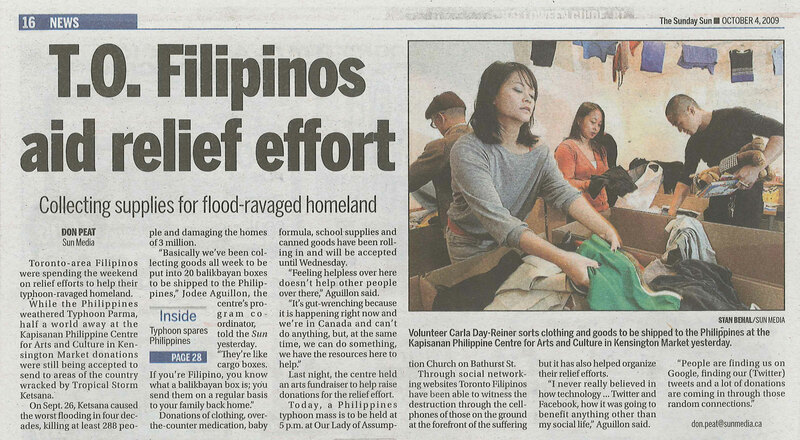 Cash or cheque donations under $50 may be made out to Kapisanan Philippine Centre for Arts and Culture (or direct to KAPISANAN's PayPal account-info@kapisanancentre.com). There’s work to be done and we at KAPISANAN, know that you, our community, will be with us in this. We’re back for Round 2 and we’re going for the knock out! For all inquiries, email giveback@kapisanancentre.com or call 416.979.0600.